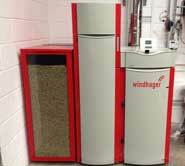 The range of Biomass boilers by Windhager & HDG come in three different fuel types, wood log, wood pellet and wood chip, and come in a range of heat outputs from 10 kilowatts (small domestic) to 1 Megawatt (large commercial). So whatever your biomass needs we have the biomass boiler to suit you. Heating with wood pellets does not contribute to climate change, as wood pellets are regarded as a carbon neutral energy source. When pellets are burnt they release solar energy absorbed during the trees growth. The CO2 released in this process is equal to the CO2 absorbed during the trees growth. In addition, localised production of wood pellets dramatically reduces transport related emissions. Wood pellets not only save energy in terms of manufacturing and delivery, but also create local employment opportunities. They are an important contribution to a sustainable future for our children. Pellets are made of 100% natural wood. Shavings and sawdust are compressed under high pressure and pressed into small cylindrical rolls and held together by lignin, contained naturally in the wood. This results in a clean, convenient fuel with a high calorific value and very low ash content (0.2%). Every year, more wood is renewed than is consumed. All of these facts are what makes the most convenient of all wood fuels such an interesting alternative in terms of both ecology and economy. Wood chips are made from whole trees, branch wood or coppice products which have been mechanically shredded by a chipping machine. Ideally the wood needs to have been air-dried before chipping, or the chips dried before burning. Waste wood from manufacturing which has no additives such as wood planings and sawdust can be a perfect way to use a waste wood for heating. Heating with a wood boiler is in harmony with nature. This is because central heating with split wood logs only releases the quantity of CO2 that the tree removed from the atmosphere as it grew. With the burning of crude oil and natural gas, however, CO2 reserves that have been stored for millions of years are released into the atmosphere in great quantities. This CO2 increases what is called the greenhouse effect. The changing of people’s ideas in the UK that split log boilers are sensible is now a reality, with the range of central heating wood boilers available. The burning of wood generates lower sulphur dioxide emissions as compared to heating with fossil fuels. Wood is transported over shorter distances from domestic woodlands and thus strengthens the regional economy. But do not worry about disappearing forests, more wood is grown each year than we consume; opt for renewable resources, choose an wood boiler for your heating needs. Please visit our show room to see for yourself a working installation and how we can help change they way you heat your home.